William Shakespeare was an English poet, playwright, and actor, widely regarded as the greatest writer in the English language and probably the world's most famous playwright. He was born in 1564 and died in 1616. The third child born to John Shakespeare and Mary Arden, his youth was spent in Stratford-Upon-Avon, England before heading into London to eventually become the playwright known today. When he was eighteen, he married Anne Hathaway, an older woman of twenty-six who was already pregnant. They had three children: Susanna, born in 1583, and twins, Judith and Hamnet, born in 1585. Unfortunately, Hamnet died in 1596 when he was just 11 years old, although this was common in a period that had high levels of infant mortality. Yet, aside from these facts, very little is known about William Shakespeare and his life. We believe that he left his family behind in Stratford-Upon-Avon for around 20 years while he pursued his theatrical career in London. He certainly became known as an astute businessman, purchasing real estate in and around Stratford after 1601. 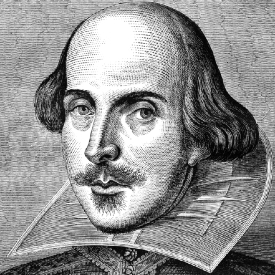 He is widely regarded as the author of 37 plays, 154 sonnets, and a portfolio of poems....although some academics cast doubt on whether Shakespeare did indeed write all the plays that are attributed to him! However, we do know that he was also an actor and appeared before Queen Elizabeth I in 1594. In 1595 he was listed as one of the shareholders of the Lord Chamberlain's Company (a theater company) and he is recorded as one of the owners of the Globe Theatre, London, in 1599. William Shakespeare's plays are performed and celebrated throughout the world and his theatrical legacy lives on. In his will, William Shakespeare left his wife the 'second-best bed'!